Deliver an extravangant Oregon's Cascade filled with over thirty pounds of the best Oregon fruits of the season, combined with unparalleled gourmet delicacies right to your door. 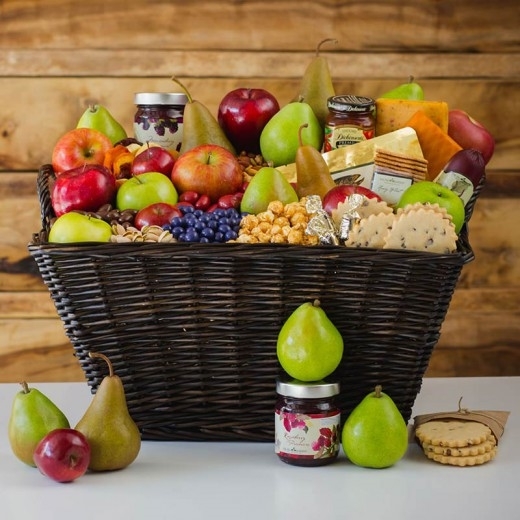 This is the ultimate fruit basket, packed to the brim with delicious pears, apples, oranges and gourmet items such as nuts, cheese and our favorite sweet treats. 1 Chocolate Covered Blueberries - 4 oz. 1 Milk Choc Covered Almonds - 4 oz.